Mike’s fascination with and championing of New Mexico’s badlands began in 1980 with his first visit to the Bisti when the fight to save it from the steel jaws of coal strip mining was just beginning. 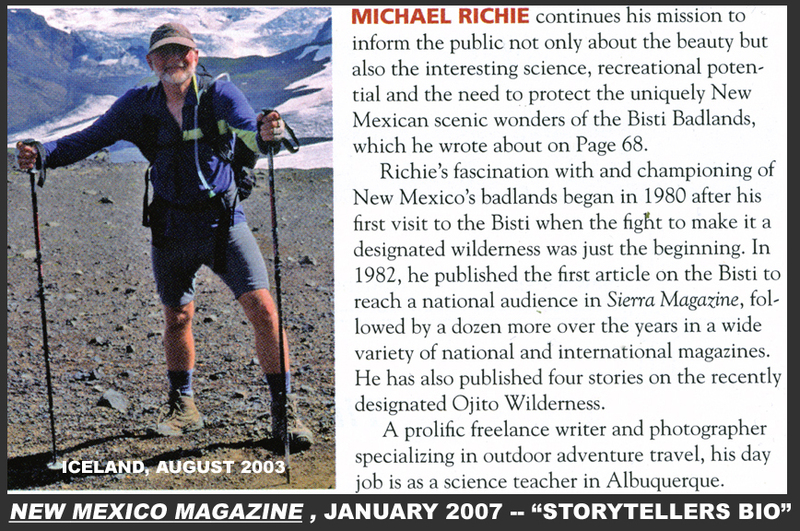 In 1982 he published the first story on the Bisti badlands to reach a national audience for Sierra Magazine. Congress designated both the Bisti and neighboring De Na Zin badlands as wilderness in 1985. 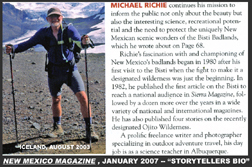 Mike has since published a dozen articles and numerous photos on the Bisti over the years for a wide variety of national and international magazines. 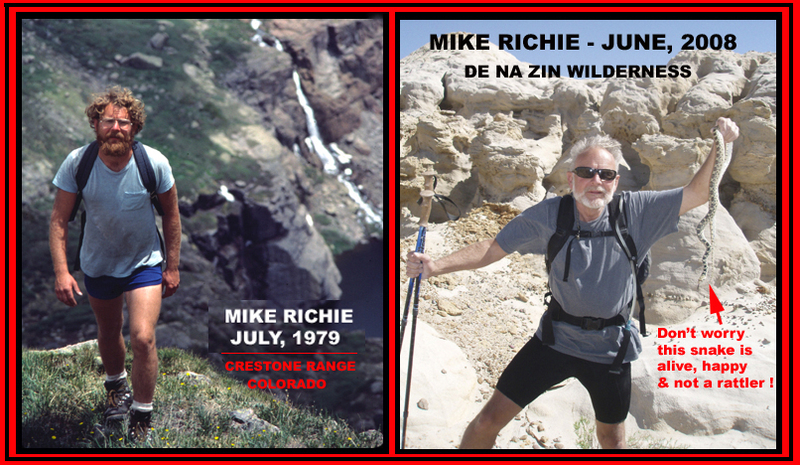 He has also published 6 articles on the recently designated Ojito Wilderness. His stories on several other virtually unknown San Juan Basin Badlands have appeared regularly in New Mexico Magazine culminating with a Jan. 2007 , 10 page feature covering all the badlands. That article became the inspiration for this site. With this website he continues his mission to inform the public not only about the badlands’ beauty, but also the interesting science, recreational potential, and the need to protect these one-of-a-kind, Four Corners Region legacies. 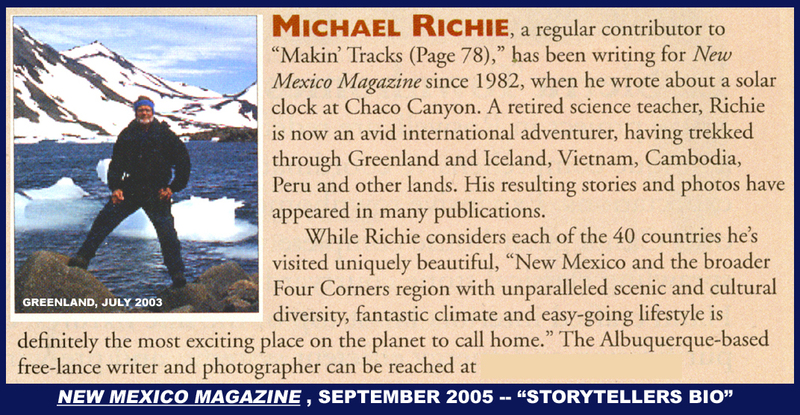 An active freelance writer and photographer with a strong background in science and natural history, Mike specializes in outdoor adventure travel but has published all sorts of additional articles and images ranging from “How to” photography pieces, to scenic drives, to historical/cultural themes. So far he’s published 237 stories and 876 photos including 20 covers, 4 calendars. Among many other magazines, his work has appeared in Sierra , Islands, Singapore International Airlines Magazine, Alaska Airlines Magazine, Delta Sky Magazine, Photographic, New Mexico Magazine, Arizona Highways, Phoenix Magazine, Durango Magazine, and the Four Corners InsideOutside Magazine. His newspaper credits include The Albuquerque Journal, The Albuquerque Tribune, The Santa Fe New Mexican, The Arizona Republic, The Dallas Morning News, and The Austin American-Statesman. An extremely avid traveler, both domestic and international, he’s visited 47 countries an all continents except Antarctica. Most recently including Prague, Croatia, Northern Italy, Vietnam, Cambodia (Angkor), southern Thailand, Mongolia, backcountry trekking in Iceland and Greenland, canoeing Amazon Basin waterways in Peru and scuba diving and snorkeling in various tropical paradises. A retired teacher, he taught Chemistry, Zoology, Honors Biology, Biology, Physical and Earth Sciences and Mathematics for 33 years including 25 years for Albuquerque Public Schools. He has a BS from University of Cincinnati and an MA from University of New Mexico in secondary and adult education with concentrations in Chemistry, Microbiology, Mathematics and Computer Science. In addition to science and math teaching he held a second concurrent job for 10 years from 1992 – 2002 with the Air Force Research Labs at Kirkland AFB in various facets of computer modeling and simulation, mostly writing graphics and data analysis software. He also held various “work/study” summer jobs prior to that with Sperry Flight Systems (1985), Honeywell (1986-1988) and Nasa (1991) again mostly as a software designer and data analyst for modeling and simulation projects. His strong background in science and lifelong love of the outdoors are the hallmarks of his travel writing and this website. Click on small image for full size.